I also have a thing for dishes that are kinda savory, kinda sweet, kinda all around confused.. Like, you could eat it for dessert, but it also makes a completely acceptable dinner kinda deal. This is one of those dishes. 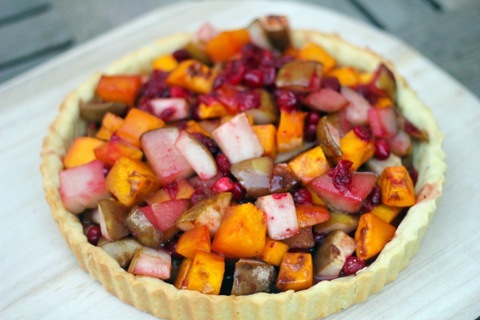 It’s an autumn tart, packed with butternut squash, pear, and cranberries. Also known as my very favorite things about fall. 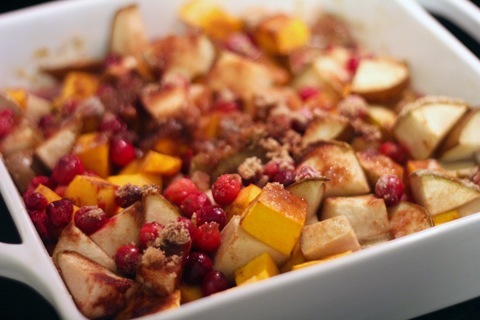 You could totally bake the squash, pears, and cranberries and then eat them out of a bowl. But I wanted to eat them out of a pie crust. So I did. Isn’t it beautiful being an adult? I can do whatever I want! I absolutely swear by Martha Stewart’s pate brisee when it comes to all things pie. 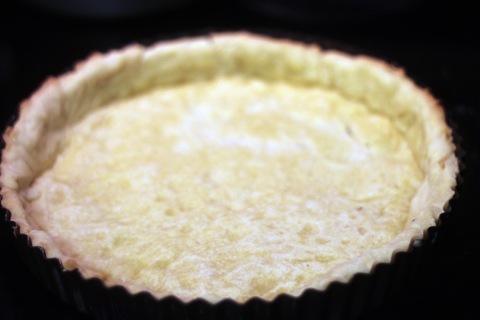 But for this tart, I decided to try something a little different. I found Smitten Kitchen’s Great Unshrinkable Sweet Tart Shell and decided it was a go. It’s a similar recipe to Martha’s, but happens to use confectioner’s sugar, which I figured could only make a lighter more delicious crust. 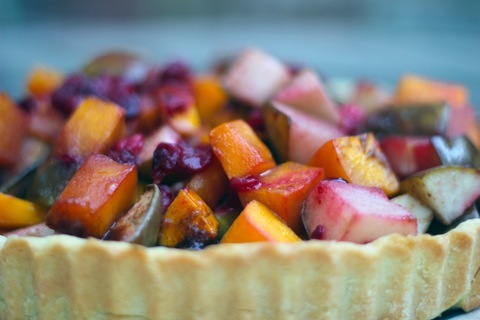 You’ll want to start with the tart shell because it does take a bit of time. As in almost 3 hours. 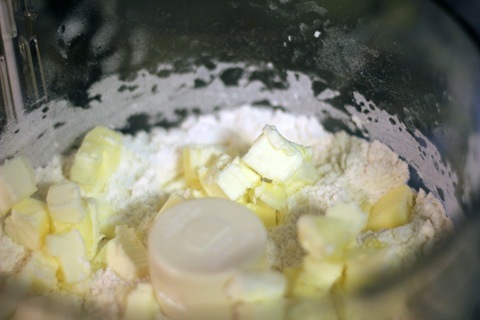 In a food processor, pulse the flour, sugar, and salt. Then sprinkle the 1 stick butter over the top and pulse until the pieces are about the size of peas. Mix in the egg a little at a time, pulsing after each addition. Then process in long pulses of about 10 seconds each. 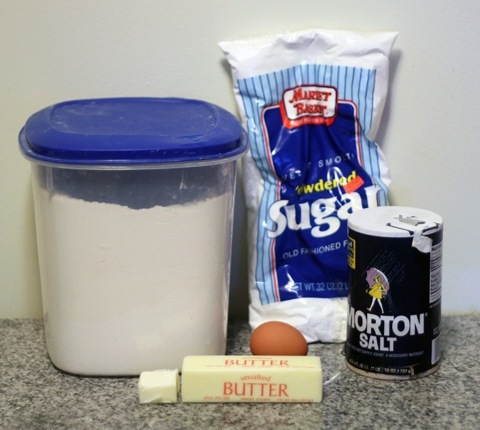 After you do this a couple times, the dough will start to clump together. 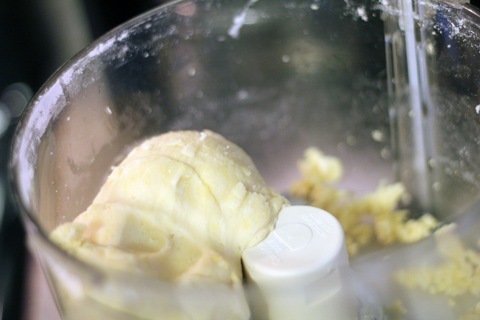 Take the dough from the food processor bowl and place it on a clean work surface. Knead it lightly, making sure to incorporate any loose dry ingredients. Now, wrap the dough in plastic wrap and put it in the fridge for about 2 hours. Take a nap. Or stare at the clock while your dough chills. Zzzz. OK, wake up! Your dough is ready. 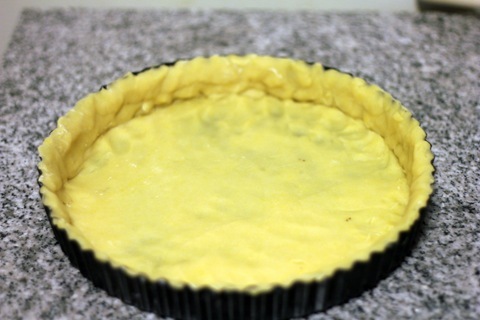 With the 1 T butter remaining, butter the bottom of a 9-inch fluted tart pan with removable bottom. Now, on a clean surface, set out a piece of parchment paper, flour it, place the chilled dough on it, and roll the dough to a 12-inch round. 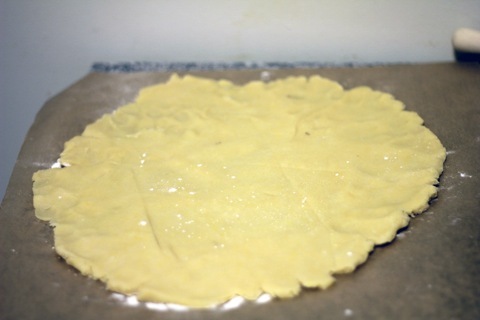 Turn dough out onto tart pan and remove parchment paper. Seal any cracks in dough and trim overhang to 1/2 inch. Then fold overhang in and make double-thick sides. Pierce dough all over with fork. 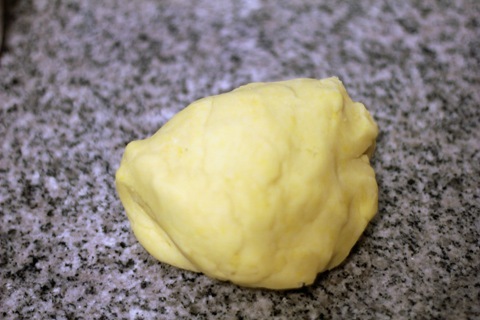 Freeze this dough for at least 30 minutes, longer if possible. Take another nap. Or just start making the pie filling. Once the crust is sufficiently chilled, you’ll want to pre-bake it. 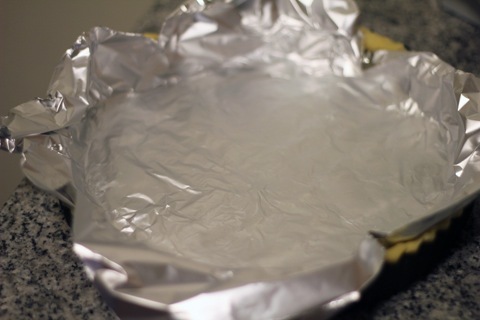 Butter the shiny side of a piece of aluminum foil and put the foil buttered side down, fitting it to the dough. 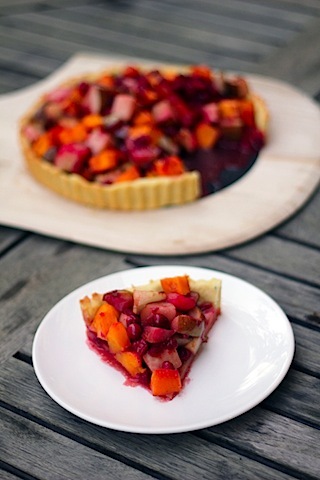 Put the tart pan on a baking sheet and bake for about 20-25 minutes. This recipe is pretty awesome because you don’t need any weights since the dough was frozen. Woot woot. Gosh, now for the fun stuff! Not that tart dough isn’t awesome stuff, but I like colors. Especially autumn colors. Er, this is also the easy part. 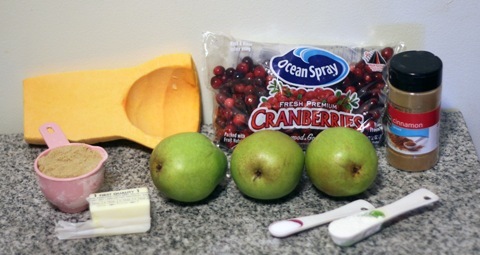 Because basically you just want to make sure your butternut squash and pears are cut into bite-sized pieces and your cranberries have been rinsed. You can peel the pears if you want, but as you may know I am totally anti-peeling fruits and veggies, so I left the skin on. And all of the deliciousness has been placed in a baking dish. 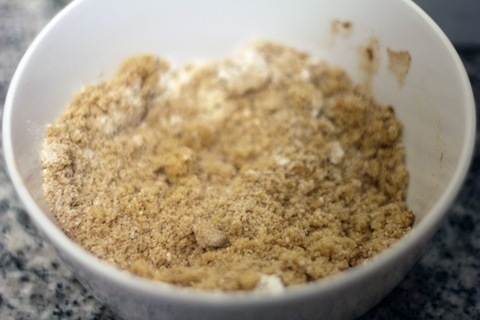 In a small bowl, mix together the brown sugar, flour, salt, and cinnamon. 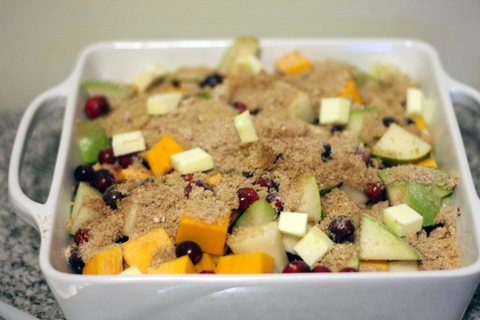 Sprinkle the brown sugar topping over the veggies/fruit. And sprinkle butter over the top. Pop in the oven at 350 degrees for about 50 minutes until everything is nice and tender. 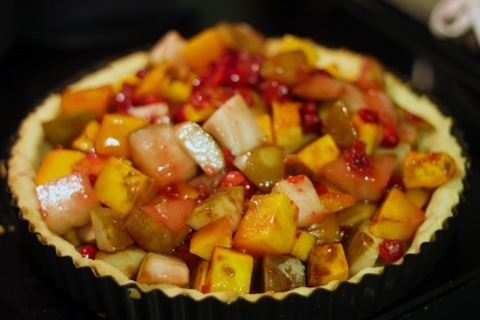 Now, put the filling in the pre-baked tart shell and pop back in the oven at 350 degrees for about 10 more minutes. Considering this was my first tart, I was pretty happy with how it came out. 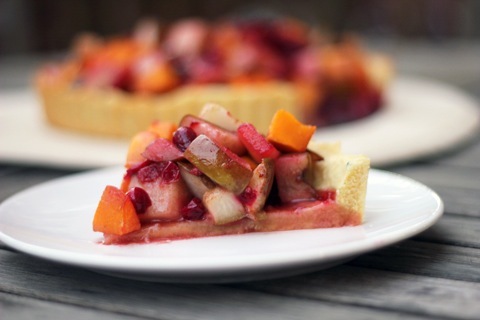 Then again, you can’t really go wrong with a sweet tart shell packed with squash, pears, and cranberries. Um, and sugar and butter sprinkled on top. I still don’t know quite what to classify this as. I’m leaning more toward dessert, mainly because there’s sugar in the crust and sprinkled all over the top. BUT I also won’t tell on you if you make this your dinner. After all, think about how good that squash is for you. My family is pretty traditional when it comes to our Thanksgiving dinner. We have so many classic dishes we LOVE that it’s hard to find much room for new and innovative. So while we don’t tend to experiment too much on the actual holiday, we love trying new dishes before and after. I am, however, making a new brussels sprouts dish for Thanksgiving dinner tomorrow. And since not everyone loves brussels sprouts, I’m bringing in the big guns with bacon and maple syrup. We’ll see how it goes. Happy Thanksgiving to all of you! I hope you have an absolutely perfect day, packed with good food and the people you love. I consider myself VERY lucky to be surrounded by so much love and happiness all the days of my life. I definitely have a lot to be thankful for this year. Also? TURKEY! 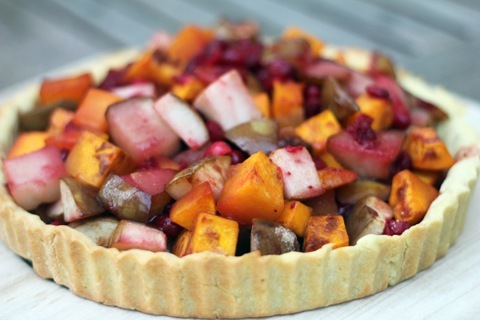 5 Responses to "Squash, Pear, and Cranberry Tart"
This tart looks PERFECT for Thanksgiving! I’m thankful for all of the love and support I’ve received from friends and family this year! All the best flavors in one place. Perfection! Happy Thanksgiving! The colors are great! 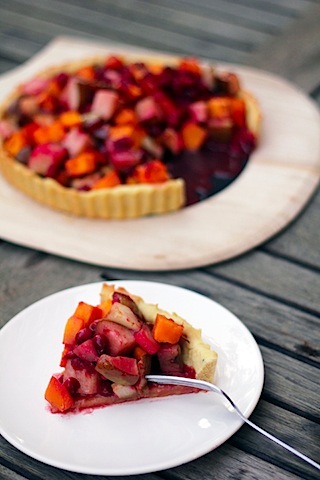 Love the pic of the whole tart in back with red juice oozing out. Yum. Happy Thanksgiving! 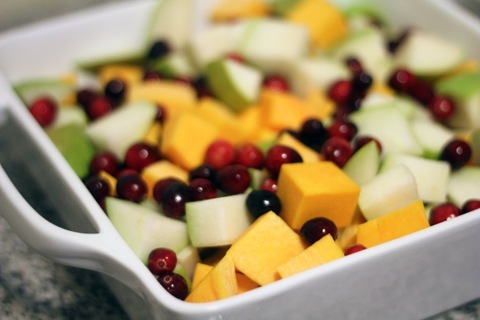 Love the squash and fruit combo. Pear is my absolute favorite.